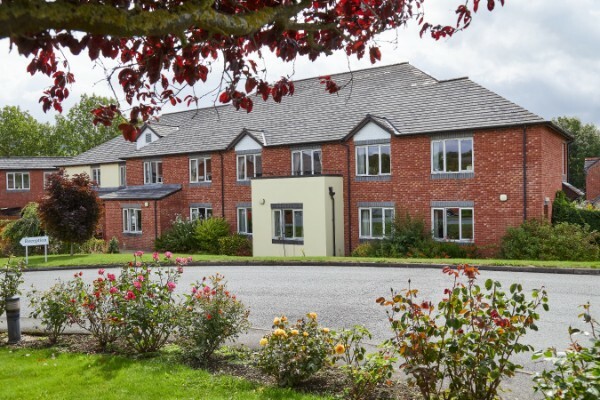 Surrounded by beautiful gardens, The Rhallt is a site with both a charming 82-bed care home and The Lodge, a boutique care home with only nine bedrooms. Across both homes, we have excellent facilities and a homely atmosphere that enable us to provide the person-centred care our residents deserve. Life with us means being part of a dedicated team. We’re all actively involved with our residents – whether that’s our maintenance team getting a room ready for someone new, our chefs creating dishes to suit every taste and dietary need, or our housekeeping staff helping residents to personalise their rooms. Our carers and nurses deliver bespoke care plans that are focused on making each resident’s day comfortable and happy, and our activities team plan engaging programmes including gardening, sing-alongs and trips out. We always aim to deliver quality care to our residents, while celebrating their individuality and helping them maintain as much independence as possible. For you, this is an opportunity to bring your career to an inspiring, welcoming and happy environment. We’ll help you to grow your skills and truly make your mark. Rhallt Lodge is just off Salop Road (A458) in Welshpool. You’ll find us close to several local amenities and within easy reach of Shrewsbury, Oswestry and Newtown – and just a few short miles up the road is the beautiful Welsh countryside. Why work at Rhallt Care Home in Powys? We offer 24-hour nursing and dementia care, as well as respite care and short breaks. We also offer care and services for strokes, physical disabilities, Parkinson’s and Huntington’s.